Loving: Carpool. I didn't think it would work but going to work has been so much easier now that I have four #NaughtyNorth girls to carpool with. Sure, I have to drive once a week, but it's not a bad deal considering I don't have to think about commuting for 3 out of 5 days of the week. And new friends to boot! Reading: I saw the second book of Jennifer Smith called, This is What Happy Looks Like and though I'm sure it's an easy read, because of my crazy schedule, I haven't made a dent in it. I'm way behind on reading, but I'm excited to get on with it. It's such a cute story and book in general. Watching: Fall TV is slowly coming back and with it comes Downton Abbey which ended on a horribly sad note last season. So I'm really curious to see how they make me like this show now that Mary/Matthew are donezo. I am not easily pleased, Mr. Fellowes. 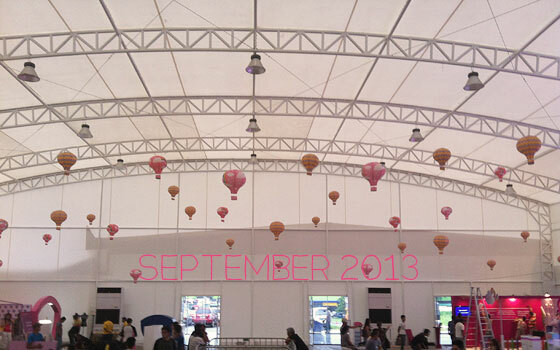 Anticipating: The #CandyFair2013! It's the big event of the mother brand I work for and it's just such a fun day. Sure, it's stressful for all those working on it, but it's always a nice kind of stress afterwards. Plus this year, a project I was working on is going to be part of it, so I hope it turns out well. Listening to: I've listened to nothing but Paramore's Still Into You. I know it's an old song but I just recently heard it on the way to an event on a rainy Sunday and it's all I've been listening to. I had to turn off my scrobbler otherwise my charts would be totally skewed. Hello lip-sync karaoke song! Planning: My holiday plan of attack. I really don't want to rush Christmas shopping this year and I think I can do this properly if I plan and strategize it this early on. There are just 100 or less days to Christmas an I need to make my lists and check them twice. Working on: Sales Con Presentations that are about to be presented. Tomorrow. I can't believe I survived this season of planning. It's my first one under different bosses and totally blind getting into it so I hope I'm doing an okay job of everything. Wishing: I was still as sweet and nice as I was before. Lately, I'm finding myself to be more bitchy and catty and just not the person I want to be. And though I do all this to get the job done, it makes me sad that I know I'm slowly changing into a person I don't like. I hope I get to stay true to who I was before all this.